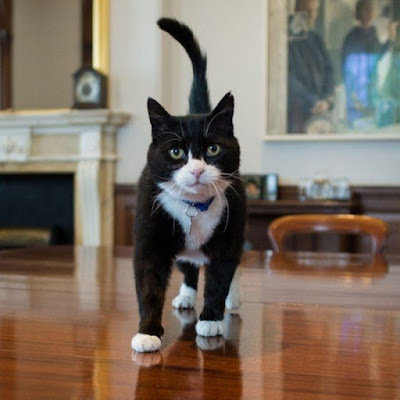 "He is definitely not a mole and I can categorically assure you that Palmerston has been regularly vetted. As for being a sleeper, he is definitely a sleeper, I am told very often in my office." Is the tiny section of Whitehall that is bordered by Downing and King Charles streets in the City of Westminster a sufficiently large enough area in order for two alpha tomcats to peacefully coexist? The world is about to find out one way or the other pretty soon now that the Foreign and Commonwealth Office has adopted a two-year-old tuxedo named Palmerston to not only serve as its resident feline but to unavoidably vie with 10 Downing Street's longtime cat, Larry, in a battle for turf, popularity, and prominence. Named, appropriately enough, in honor of Viscount Palmerston (né Henry John Temple) who not only once served as Foreign Secretary but also twice as prime minister during the mid-nineteenth century, he arrived at the Foreign Office in early April courtesy of the Battersea Dogs and Cats Home in south London. No other monikers were reportedly even so much as entertained. In fulfillment of that objective, a cake sale was held April 12th at the Foreign Office. Apparently, it never so much as crossed the minds of any of the highly-paid civil servants to take personal responsibility for Palmerston's minimalist financial needs; instead, they have insisted upon behaving like down-at-the-heel bums who cannot even afford to so much as part with bus fare to the office. As it invariably always turns out to be the case, cheapness and callousness only beget more of the same and the proof of that is to be found in the bargain basement housing arrangement that the Foreign Office has lined up for its newest and most famous staffer. For instance, whereas he initially was allowed to bunk in the office of Permanent Under-Secretary Sir Simon McDonald, who also gave him his name, he now has been exiled to some kind of undefined makeshift shelter in the Foreign Office's courtyard. Unless this facility is at the very least located in a safe area, commodious, enclosed, heated, and waterproof, McDonald and the entire Foreign Office bureaucracy should be charged with animal cruelty and promptly jailed. Even as such, to adopt a cat and then turn around and treat it far worse than bloodsucking farmers in the United States do their itinerant seasonal laborers is nothing short of shameful. 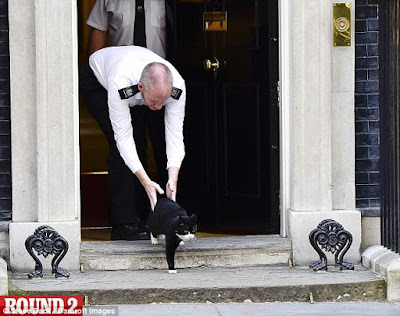 On the contrary, Palmerston deserves to be afforded unfettered access to the indoors, either an office or a house, where he can feel safe, warm, and dry at all times and is not completely cut off from all human contact. Predictably, this totally outrageous living arrangement has been wholeheartedly approved of by Battersea which has demonstrated time and time again that it will gladly sell any cat down the river for as little as a farthing. 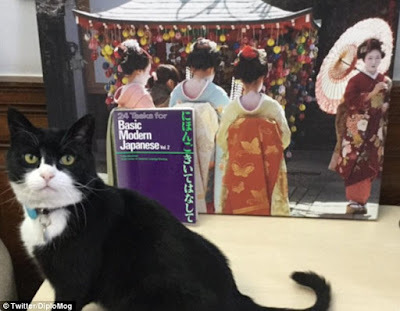 "We have worked closely with Battersea Dogs and Cats Home on Palmerston's deployment and they have inspected his new home, as they do for all pawtential (sic) new owners of their rescue cats," the Foreign Office spokesperson preened to BuzzFeed. The Foreign Office's shabby treatment of him is made all the more unconscionable in light of the fact that his life to date has been anything but a bowl of cherries. The public record is far from complete but he apparently was found hungry and underweight wandering the forlorn streets of London sometime last year. Now, his life has come full circle in that he has traded a meager existence on the mean streets for makeshift quarters in a courtyard. While it is always conceivable that he will recognize a discernible improvement in his circumstances, the odds bode against that happening and that is going to be even more so the case on all of those interminably long, cold, foggy, and rainy London nights when he is left to tough it out by his lonesome. For whatever it possibly could be worth, the Foreign Office is adhering to the old familiar bromide that its premises are so overrun with mice that even professional exterminators are not up to the task of keeping them in check. 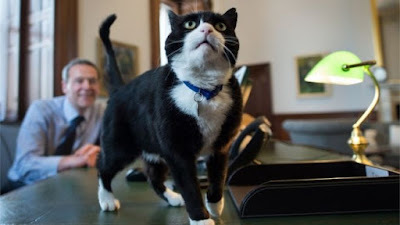 "Palmerston is Her Majesty's Diplomatic Service's newest arrival and in the role of Foreign and Commonwealth Office Chief Mouser will assist our pest controllers in keeping down the number of mice in our King Charles Street building," its spokesperson told BuzzFeed. In that respect, Palmerston has gotten off to a roaring start in that after only a little more than a month on the job he already had been credited with three kills. That in turn earned him a "more than satisfactorily" rating from then Foreign Secretary Philip Hammond who since that time has moved on to become Chancellor of the Exchequer in the government of new prime minister Theresa May. Another, albeit considerably less plausible, explanation could be that the diplomats simply like cats. "Freya's been missed so much and everyone's looking forward to having a cat around the place again," an unidentified governmental staffer confided to BuzzFeed in the April 11th article cited supra. Even if credible, the explanation afforded by the governmental source would tend to imply that Larry either seldom visits the Foreign Office or that is presence there is unwelcome. Furthermore, since he has lived next door for the past five and one-half years the diplomats certainly have had more than ample time in order to have put out the welcome mat for him. The most plausible explanation therefore is that Palmerston, like Larry and all other cats shanghaied into the rough and tumble world of English politics, is being exploited by the Foreign Office in an effort to deflect criticism of its policies as well as to cast the diplomats in a far more favorable public light than otherwise might be the case. It also is likely that he was brought on board in anticipation of England's exiting of the European Union (EU) and thus assuming a much larger role on the world stage as an independent nation. Besides sufficing as a more than able-bodied mouser in his species' oldest calling, Palmerston already has established himself as being very much the epitome of a forward-thinking, modern-day cat. For example, he not only is adept at using Twitter but also authors a diary in an internal newsletter that is published by the Foreign Office. Although generally speaking Palmerston has gotten off to a good start in his new job, it has not been all smooth sailing. In particular, ever since no less than five dons from Cambridge University were unmasked as KGB spies during the last century, the English have been, quite justifiably, obsessed with moles. Owing to her frequent visits to the Foreign Office, even Freya became unwittingly enveloped in a cloud of suspicion as being a sleeper and the same baseless accusations have dogged Palmerston almost his first day on the job. "Has Palmerston been positively vetted by the security service (MI5) and scanned for bugs by Government Communications Headquarters," Tory MP Keith Simpson of Broadland in Norfolk pointedly asked Hammond on May 24th according to the BuzzFeed article of the same date cited supra. "Can you assure the House, and the more paranoid elements of the Brexiters, of Palmerston's provenance and that he is not a long-term mole working for the European Commission?" That was one concern that Hammond certainly was well prepared to put to rest. "He is definitely not a mole and I can categorically assure you that Palmerston has been regularly vetted," he averred to BuzzFeed. "As for being a sleeper, he is definitely a sleeper, I am told very often in my office." While he was at it, he also took full advantage of the moment in order to take yet still another whack at an ax already ground down to the handle by the likes of Nigel Farage, who has represented southeast England as an MP in the European Parliament in Brussels ever since 1999, and he did so by ridiculing the work ethics of the Commission. "But unlike Freya, who went missing for two years, his attendance has been one-hundred per cent," Hammond crowed. "My experts tell me that pretty much rules out the possibility of him being a Commission employee." 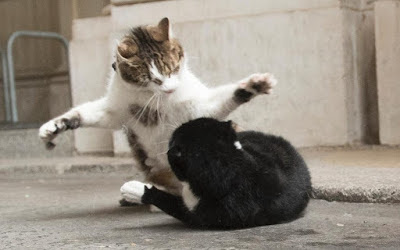 It was not long after he had been exonerated as being a spy that Palmerston became embroiled in a series of well-publicized street brawls with Larry. The first one occurred on July 17th when the latter ventured onto the grounds of the Foreign Office. There was not any apparent bloodshed although Larry later received veterinary treatment on July 20th for a limp that he had developed in his front right leg. For his part, Palmerston later was photographed with a patch of fur missing from his back. Although the Fleet Street crowd had characterized the scuffling between Palmerston and Larry as a turf war, that may not be a completely accurate description of it. Given his past history and especially his cruel eviction from the cozy confines of the Foreign Office, it is entirely possible that Palmerston is merely searching for the secure, indoor home that he has been denied for all of his existence. If there is any truth in that surmise, the simple solution to this dilemma would be for the Foreign Office to now do what it should have done in the first place and that would be to bring Palmerston in from the cold by providing him with living quarters somewhere inside its sprawling complex. If such a policy change accomplished nothing else, it would significantly reduce the number of chance, and potentially violent, interactions with Larry. That does not appear, however, to be among the options currently being considered by the politicians. 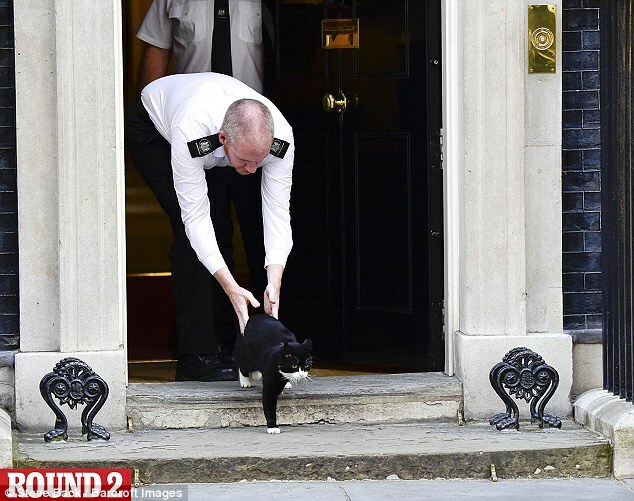 "I have to say, I saw some reports in the media that (Larry) had been involved in a fracas with the Foreign Office cat, but I hope that they have now established a modus vivendi," the Tories' leader in the Commons, David Lidington of Aylesbury in Buckinghamshire, told The Telegraph in the July 21st article cited supra. As far as it is known, that has yet to happen and, besides, intelligence and due diligence have shown themselves down through time immemorial to be much better palliatives than wishful thinking when it comes to resolving difficulties. The good news is that the fights so far have not amounted to much and that augurs well that the cats eventually will be able to work things out amongst themselves. Since Battersea never would allow any intact cat to escape from its penitentiary, both of them most assuredly have been neutered and that expedient, in most cases, significantly curtails the aggressive tendencies of males. Plus, since neither of them is either overly large or muscular that would tend to limit the amount of damage that they are capable of inflicting upon each other. Perhaps most important of all, there are not any known fertile females in the neighborhood for them to fight over even if they should be so inclined. Nevertheless, the interactions between them need to be closely monitored in order to ensure that they do not turn into life and death struggles. Should that occur, the safest way to separate them would be with a water pistol. In extremely violent cases, it sometimes is necessary to physically separate fighting toms even though that involves risks. In that regard, scratches are not anything to be overly concerned about even though they certainly can sting for a while. Bites on the other hand can result in painful, debilitating infections that have been known to drag on for more than a month. Sometimes a prompt and thorough application of hydrogen peroxide that is accompanied by over-the-counter antibiotics, such as Bacitracin Zinc, Neomycin Sulfate, or Polymyxin-B Sulfate, will suffice but at other times only prescription antibiotics are strong enough in order to ward off serious problems. The key therefore when it comes to separating warring toms is not to get either bitten or scratched in the eyes. In furtherance of that objective, protective goggles and long, padded gloves often are necessary. Although sporadic outbursts of this type of aggression may sometimes appear and sound as if murder and mayhem are being committed, it usually is best for both guardians and onlookers not to intervene unless blood is spouting and the fur is flying. It is entirely permissible, however, to attempt to distract the belligerents with either treats or some other alternative method. None of those expedients may be necessary in this case owing to the fact that there is not any obvious reason why that Palmerston and Larry cannot eventually learn to peacefully coexist. They might even some day become friends. Transcending all of those concerns, Palmerston and Larry are pretty much in the same boat and need each other. In the newcomer's case, his original benefactor has been replaced by Boris de Pfeffel Johnson who now reigns as Foreign Secretary. Unfortunately, absolutely nothing is known about the transplanted New Yorker, who earlier this year completed his second four-year term as mayor of London, and his views regarding cats. Larry likewise lost his protector, David Cameron, in July and his fate is now in May's hands. Although there have been some indications that both his position and home are safe for the time being, things can change in the twinkling of an eye at 10 Downing Street. 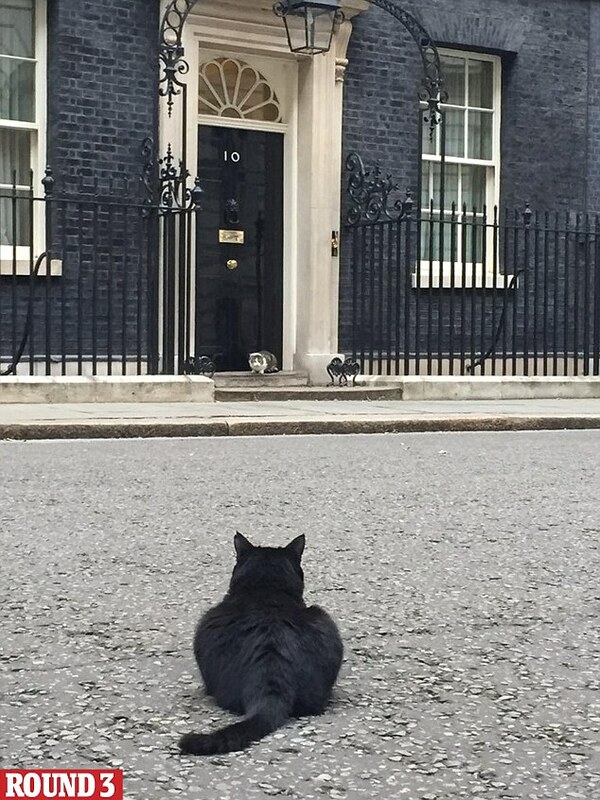 In that regard, it is well-known that Johnson dearly covets May's job and some political pundits have speculated that Palmerston's storming of the world's most famous black door was merely the opening salvo in what is destined to be a protracted battle to wrest power from her grasp. If so, the coup plotter's modus operandi would appear to be first to get rid of her cat and then her. Regardless of how events ultimately unfold for both Larry and Palmerston, it goes almost without saying that the lot of all cats is an outrageously unfair one. First of all, they are denied any say whatsoever in either where they live or under what conditions. Secondly, they never are given so much as an inkling whenever those who have assumed dominion over them are about to pull the plug on their earthly existences. Those sad realities are facts of life for both those that are famous, such as Palmerston and Larry, as well as for those who live out their brief lives in obscurity. Rather than striving to enhance their lives and status and thus to set an example as to how that all cats should be treated, the cruelties, neglect, and injustices meted out to those of the rich and famous serve only to underscore once again the sobering reality that in this world cats have almost no rights at all. 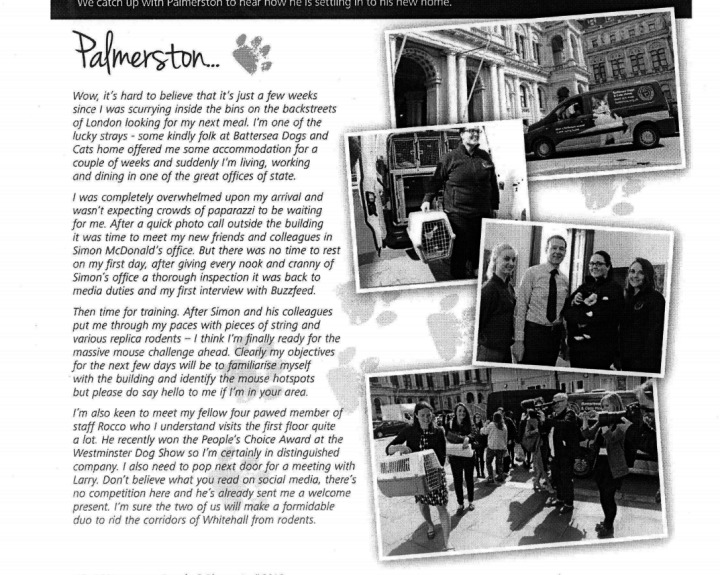 Photos: BBC (Palmerston up close and with McDonald), Twitter via the Daily Mail (Palmerston with a Japanese language book), BuzzFeed (Palmerston's diary), Paul Grover of The Telegraph (Palmerston and Larry fighting), and the Daily Mail (Palmerston being evicted from 10 Downing Street and his standoff with Larry).